Three Modes: Continuous, Modulate and Burst. Patient compliance meter: Shows treatment times in hours. Pulse Frequency: 1Hz-160Hz (adjustable), 1Hz/step (1-20Hz), 5Hz/step (20-160Hz). Pulse Width: 50μs - 260μs (adjustable), 10μs/step. • M: Modulated Width. Pulse width is automatically varied in an interval of 6 seconds. The modulation range of pulse width is from setting value to 35% less than the control setting value, then returns to the setting value then returns to the setting value. Rate, width and intensity are fully adjustable. LCD: Shows modes, pulse rate, pulse width, timer, CH1/CH2. TENS/EMS Units & Stimulators can be found in our extensive online collection of products from globally recognized and trusted brands, including ProMed Specialties. 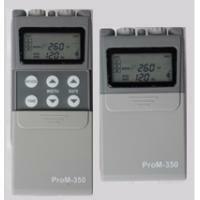 An excellent option to consider is the ProMed Three Mode Digital TENS Unit with Timer, Dual Channel.